I filmed today's card (and video) a couple of weeks ago, then I got super sick. Almost like the beginning of the school year sick, but this is the one that hits right before the holidays when you just don't have time to actually be sick. Lemme tell y'all, it's been a nightmare. But I'm finally getting this up to you, just in time for the holidays! Yay!!! I recommend watching in HD over on YouTube! I apologize for the scratchy voice and scattered thoughts, I've been on some sinus medication. But today was the only day where I've had a bit of quiet time so today was the day that I had to do the voiceover. Check out the video above for a list of the Copic markers I used on this card as well as a warning about what happens if your Perfect Pearls aren't perfectly dry before you continue with the card. I hope you like today's card (and video) and are inspired to create something of your own. If you haven't already, please follow me on the right side bar, over on Facebook and on YouTube! Drop me a line in the comments section below and let me know what you think. I cannot tell you how much every "like", follow, thumbs up and comment means to me. I love being a part of this community and hearing from all of you is a huge part of that! I hope you all have a very Merry Christmas and a super Crafty New Year!! I know I promised this post on Sunday, but other things happened and it didn't work out for me. But it's here today, and I'm feeling lucky I've gotten this far. My computer is being rather uncooperative and I'm starting to feel rather hostile towards it. So today's card (and video) are a little different. There's only a little bit of stamping for the greeting and zero colouring. I wanted to share a card that has been in my head for a little while and maybe appeal to some of the people who aren't into stamping and colouring as much as I am. In the video you'll get to hear how this card didn't go according to plan as well as my thoughts on the Nuvo liquid glue. All of your support and encouragement mean the world to me and I cannot thank you enough for every comment, like/thumbs up and follow you guys have given me. You are all awesome. 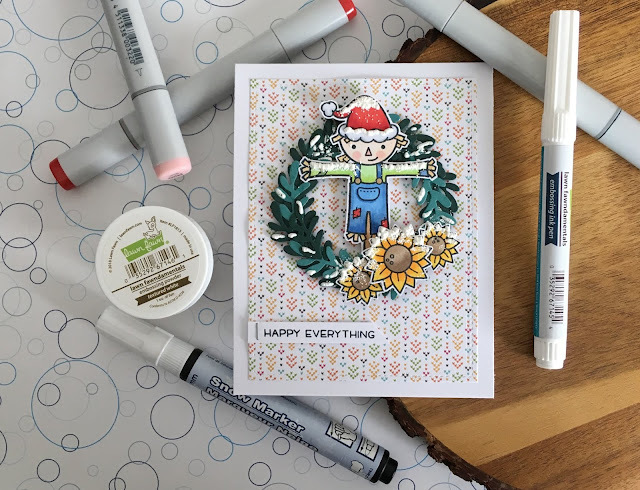 Happy Holidays 2018 | Using up the Scraps ft. 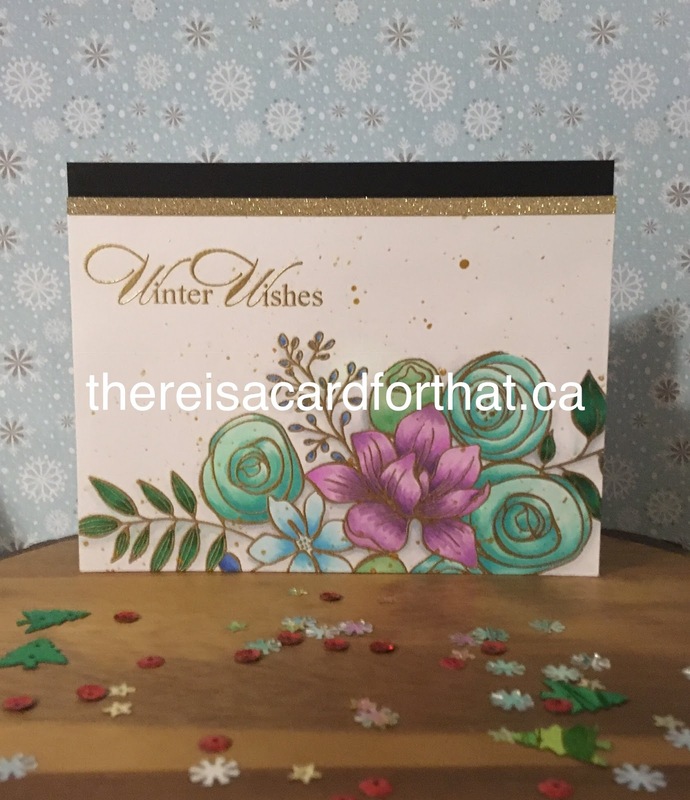 Lawn Fawn "Winter Skies"
Today I want to share a card for the 2018 Happy Holidays Series using up the scraps. 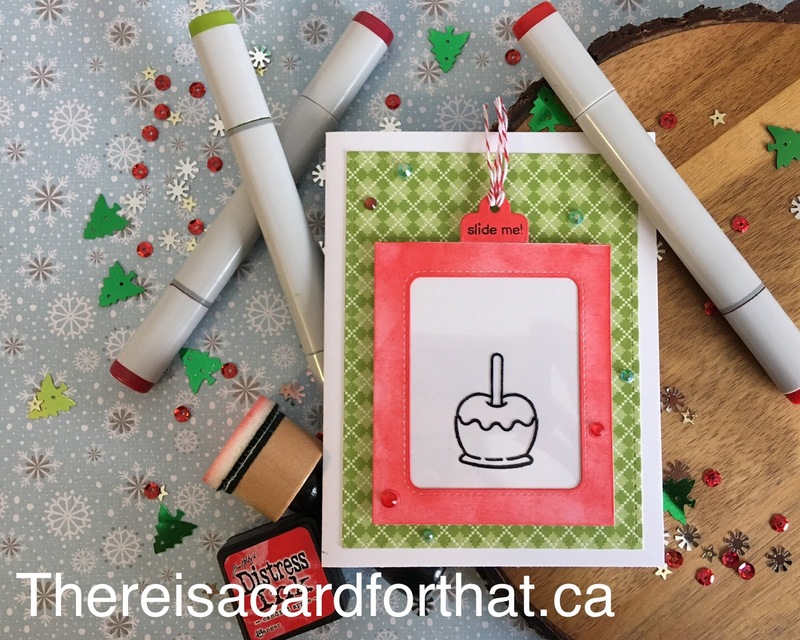 If you're like me, you stamp and colour more than you need, then you don't have the heart to toss the extras away, because you could probably use them on a card at some point in the future.... maybe. This card is created completely using the scraps from that were left over from other cards. Even the background was made while I was just playing around trying to get motivated. It's been hard for me lately. 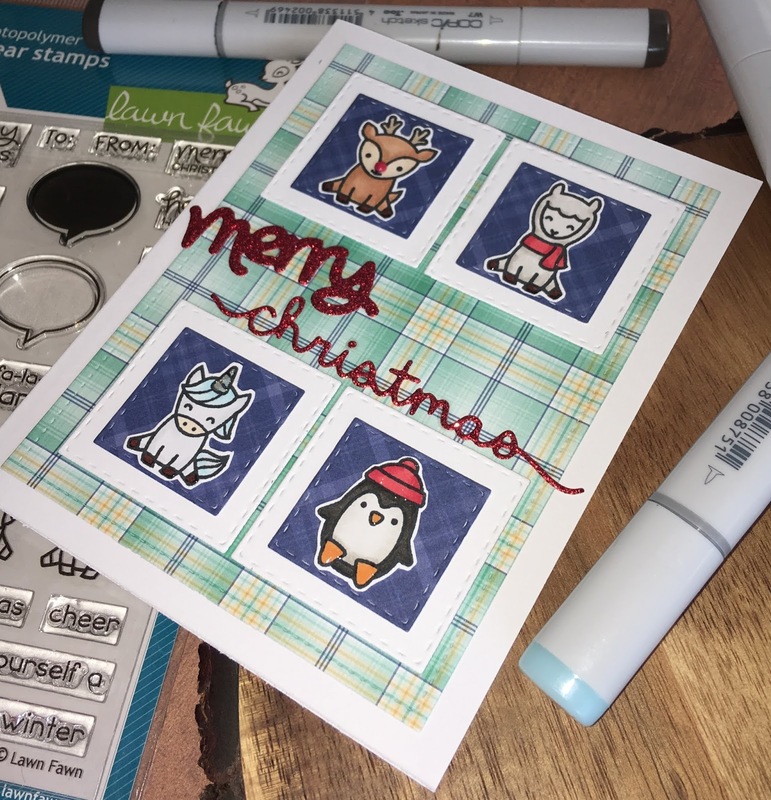 I stamped the trees and these snuggling critters from Lawn Fawn's "Winter Skies" stamp set with Memento Tuxedo Black ink on 110lb Copic-friendly cardstock and coloured them with Copic markers. I created the background by sponging Peacock Feathers, Blueprint Sketch and Chipped Sapphire Distress Inks onto Bristol Smooth cardstock, I added some Black Soot around the edges, just to darken it up a bit. To create the Northern Lights look, I sponged on Twisted Citron, then used the edge of my blending tool and swooshed it up - much like the flicking motion I use when I colour with Copic, just with the sponge. Once I had selected all the pieces, it was just a matter of putting them together! The only new thing I did today, was stamp the greeting with VersaMark Ink and heat embossing with fine white embossing powder. I hope you enjoyed today's card and are inspired to create something of your own. If you haven't already, please follow me on the right side bar, over on Facebook and on YouTube. Drop me a line in the comments section below and let me know what you think. Happy Holidays 2018 | Action Wobbler ft. MFT "Jingle All the Way"
Hello everyone, thank you for stopping by. I hope you're having a great day! 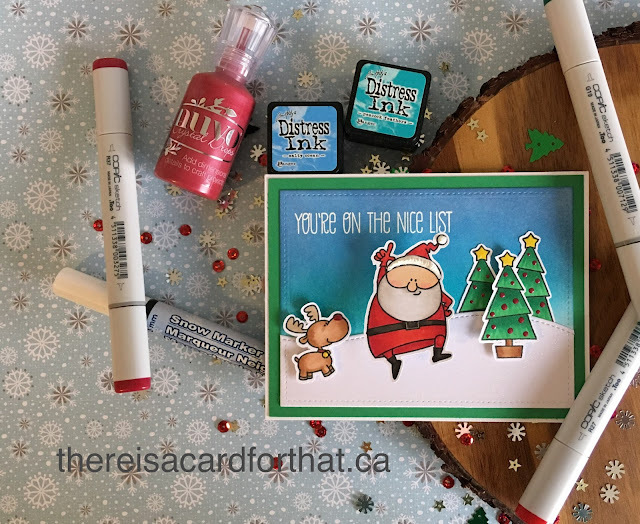 Today I want to share a card (and video) featuring My Favorite Things "Jingle All the Way" stamp set! That's right, folks. No Lawn Fawn in this one.... except for the dies, but shhhh! Check out the video above to see how this super cute card came together. You'll also see the extensive list of Copic markers that I used (there's a lot), how I got the texture on his hat as well as hear about my new (to me, I'm sure everyone else already knows) discovery for editing my videos!! I cannot even tell you how excited I am about this!!! - 5 exclamation marks excited. That should tells us all something right there, yeah? I hope you like today's card (and video) and are inspired to create something of your own. If you haven't already, please follow me on the right side bar, over on Facebook and on YouTube! (For real, I get legit excited when I get new subscription notifications). Drop me a line in the comments section below and let me know what you think. 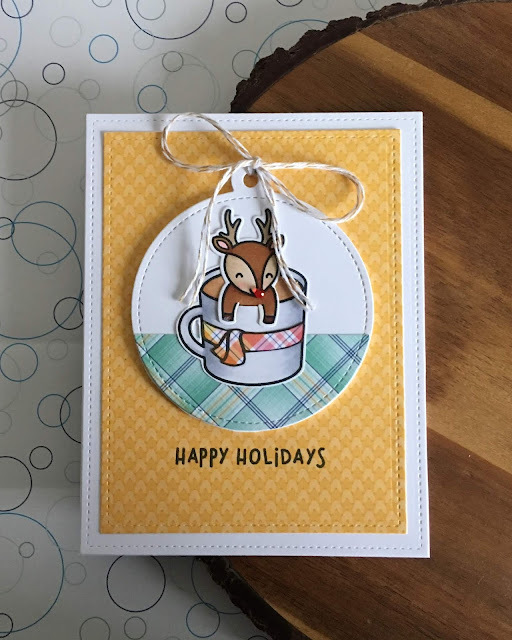 Today I want to share a card (and video tutorial) for this year's Happy Holiday Series, featuring Lawn Fawn (surprise, right?!) 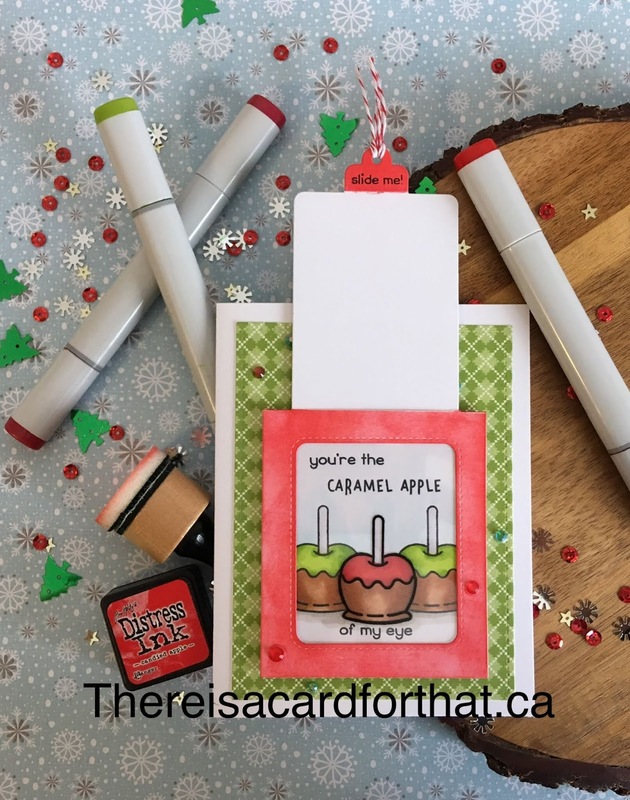 "Magic Color Slider" Die set with the "Caramel Apple" and "Sweet Christmas" stamp sets. This card really fits more between Halloween and Christmas because the caramel apple, I think is more of Halloween thing, right? But I'm using Christmas colours so it'll work. LOL I think that's the best part about card making, is being able to just change up the colours and say it's for a different season. One little change and it's a whole new card for a whole new season! Don't believe me? Check out this video here. I wanted to keep the outside relatively simple, so that the slider would reveal a super fun surprise! I mean that's the point right? The interactive die sets can be incredibly intimidating, but I've found that they are super intuitive. If you're like me, you're probably watching the release videos the minute they're out (how else are you putting your wish list together?) and the instructions that Kelly Marie provides are always great. See? Super surprise! I LOOOVE this die set. I really don't know why I don't use it more. The best part is, you can combine this set for the outside of the card with any of the pop-up sets for the inside of the card for someone you REALLY want to surprise. I wonder how many different interactive sets could be used on a single card. 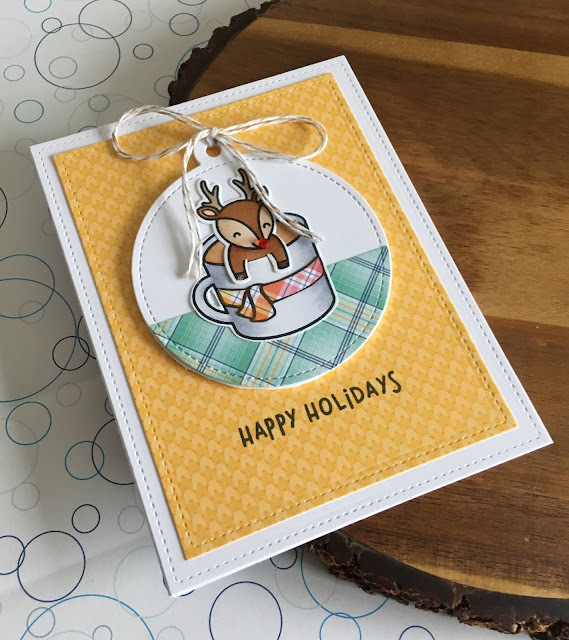 Today I want to share a card (and video) featuring Lawn Fawn's "Say What Christmas Critters", Merry Christmas border die as well as the Merry from the "Happy, Happy" add-on die set. If you check out the video, you'll see the list of Copic markers I used to colour all the little critters, as well as hear about the type of paper I use and where these little gems (on his nose) came from. I hope you like today's card (and video) and are inspired to create something of your own. If you haven't already, please follow me on the right side bar, over on Facebook and on YouTube! Drop me a line in the comments section below and let me know what you think! Missing You | ft. Studio Katia "Floral Trimmings"
Today started out not awesome. It wasn't as bad as Monday, but it definitely wasn't spectacular. Then my honey sent flowers to my office and it turned my day right around. Not only was it the first time he has ever sent me flowers, it absolutely made my day to know that he was thinking about me and the hard time I've been going through the last couple of days. I think a lot of our motivations in crafting comes from these very things. Just letting someone know you are thinking about them, especially when they are having a difficult time can make all the difference in the world. You never know how you can turn a day around just by sending a card to let them know they are in your thoughts. I highly recommend it. Today, I want to share a card featuring Studio Katia stamps and embellishments. This card wasn't made for anyone in particular, but it's always good to have one on hand for those times when someone just happens to pop into your head out of the blue. To begin, I stamped the "Floral Trimmings" stamp from Studio Katia with Memento Tuxedo Black ink on 110lb Copic-friendly cardstock. I coloured the images in with Copic markers. Like I talked about in my video "You are so Loved", I generally like to go big and bold with my floral colouring. Just throwing sunshine off the page, so to speak. That's what I was going for in this image. To add some detail, I used a white gel pen to add highlights to the petals and leaves as well as dots in the middle of the larger flowers. 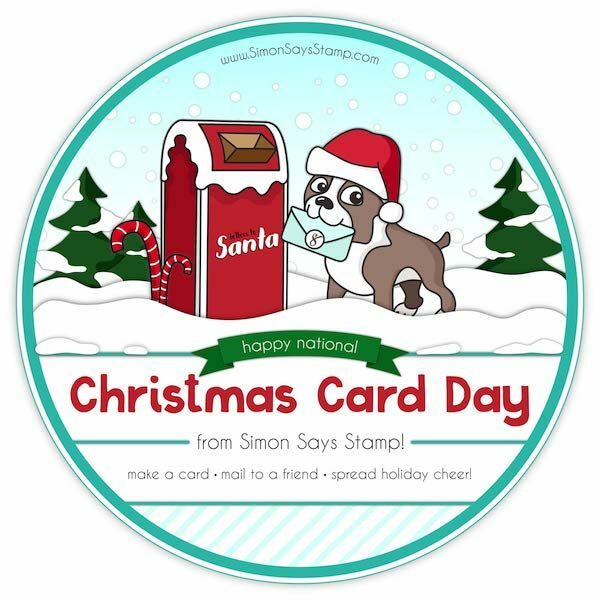 I then stamped the greeting from Simon Says Stamp with Memento ink over top of the image. I adhered the panel to a piece of coordinating pink cardstock then mounted the entire piece to the front of an A2 sized card base. Then, because I'm me and I just can't resist, I added a scattering of crystals from Studio Katia across the panel. I hope you like today's card and are inspired to create something of your own, and maybe let someone know you're thinking of them. If you haven't already, please follow me on the right side bar, over on Facebook and on YouTube. Drop me a line in the comments section below and let me know what you think. You're a Star | ft. Lawn Fawn "So Jelly"
Today I want to share a card that I created using Lawn Fawn's "So Jelly" stamp set along with Distress Oxide inks and Copic markers. To begin, I cut down a piece of Bristol Smooth cardstock and used Carved Pumpkin and Spiced Marmalade Distress Oxide inks to create my background. Once that was dry, I prepped the piece with my powder tool and stamped the starfish from the So Jelly stamp set with VersaMark ink and heat embossed with clear embossing powder. I then splattered the panel with clean water to get that distressed look we all love, then splattered again with gold Perfect Pearls. To get a bit more dimension in my starfish, I went in with some Copic markers to add some shadows and highlights. I adhered that directly to my standard A2 sized card base. I heat embossed the greeting with detail white embossing powder and mounted the strip with foam mounting tape (from the dollar store). To finish off the card, I used some of the small bubbles, scattered about the panel. Floral Thoughts Series If Friends Were Flowers | ft. Clearly Besotted "Pretty Pansies"
If you aren't having a great day, then I hope you are at the very least having a better day than I am. We've talked a lot about how my schedule has been crazy; full time job, three kids, just life etc. But I'm trying to post more often, I'm trying to be in the craft room more often, and it's a challenge. Lemme tell y'all there are days where I get home and I just want to go to bed. I don't have an overly physically demanding job, but it is mentally (and emotionally) exhausting. So today being more challenging than most, especially after taking a few days off to do mom stuff, today I just wanted to through up my hands in the air and be done with it all. I cried. Actually cried at my desk. Now, I'm not one to typically let other people see me cry, but it couldn't be helped. So when my husband asked me what I wanted for dinner, I told him a bottle of wine and a jar of Nutella. No joke. He declined. Which I think is rather unsupportive. Not really, he's probably right. And we didn't have wine or Nutella for dinner. The plan when we got home was to sit and watch a show, but I felt that in an effort to bring myself a bit of joy today, I was going to blog first. So now you all know where I'm at. I don't blame you at all if you've just skipped over the last couple paragraphs. Anyway, for today's card I wanted to share a beautiful new (to me) stamp set from Clearly Besotted. I gotta say that when it comes to floral images, Clearly Besotted is the place to go. Their images are so detailed, and yet leave you enough space to colour using any medium your heart desires. To begin, I stamped the larger floral image from the Pretty Pansies stamp set, using Memento Tuxedo Black ink on 110lb Copic-friendly cardstock, then masked that off and stamped it a second time along with the greeting. I masked off the second image and used some Lawn Fawn "Butter" ink to add a bit of colour to the background around the flowers. I removed the masks and coloured all the images in with Copic markers. Interestingly, I know what a pansy looks like, but I had to Google it to actually get my colours. In retrospect, that seems silly, because I could have coloured this any old way I pleased. I used some cool grey markers to add a small drop shadow, which isn't even really noticeable, but you would probably notice it if it weren't there. I adhered the panel to the a piece of coordinating purple cardstock from my stash and then mounted the whole lot to the front of a standard A2 sized card base. To finish off the card, I covered the blossoms with clear Wink of Stella, then added crystals from Pretty Pink Posh. It's That Time Again 2018 Edition | ft. 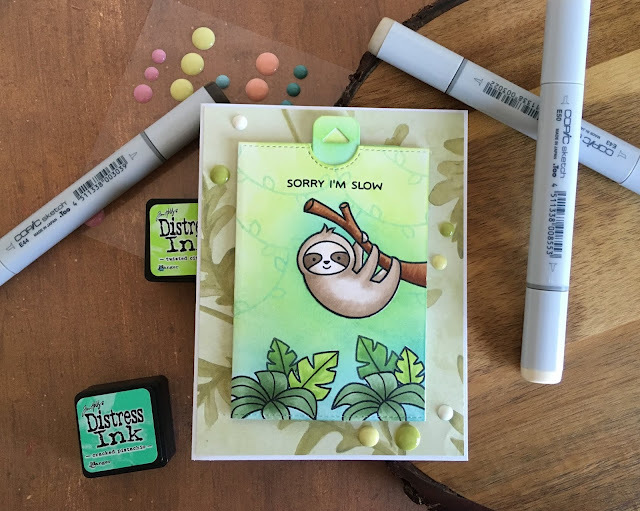 Lawn Fawn "Thanks a Latte" and "Happy Harvest"
I know I promised another sloth card in my video yesterday, but sadly life got in my way and I was unable to get to it. It is International Count Your Buttons Day - also a thing, you can totally Google it. There's a great link if you are looking for what International Day it happens to be. Because who doesn't like a fun holiday. Every year, I try to include a Pumpkin Spice card. What says fall better than pumpkin spice? Exactly nothing. You can see the 2017 card here, and the 2016 card here. In continuing with my tradition, it is a tradition if it's three years running, right? Today, I want to share the 2018 of my Pumpkin Spice Coffee card. I've made others and you may find them if you go back through the blog. To begin, I stamped the cup from Lawn Fawn's "Thanks a Latte" stamp set with Memento Tuxedo Black ink on 110lb Copic friendly cardstock. I did mask off the back rim, so I could add these little pumpkins from "Happy Harvest". I then stamped the scarf and did a bit of stamp surgery to get my greeting. All the images are coloured with Copic markers. To finish off the panel, I used clear Wink of Stella over the scarf. I then mounted that panel on a piece of orange cardstock and then adhered the whole piece to the front of a standard A2 sized card base. Today I wanted to share a card (and video) for an interactive, masculine and SUPER cute belated birthday card, featuring Lawn Fawn's "Double Slider Surprise" die set, "Hang in There" and "Critters in the Jungle" stamp sets, all in honour of International Sloth Day. That's a thing. You can Google it. So I had a completely different card in mind when I woke up this morning, and not gonna lie - it took a bit for me to get that one out of my head, or at least off to the side, so I could create this one. Sloth Day only happens once a year, and I'll not miss it. They are, after all, my most favouritest of animals. In the video you'll see the list of Copics that I used to create this card, I also discuss why this die set gives me the most trouble out of all the interactive sets I have. As well, in the interests of full disclosure, I do go off on a pretty long tangent about the value we put on our work, and why it is important that we continue to do what we love BECAUSE we love it, not to make everyone else happy. Oh, and you'll also see me make a bit of a masking error and how I fixed it. This video is loaded with stuff today; I didn't even list them all! I really wanted the sloth to be the star of the show, not counting the interactive element, as that generally steals the show. We all love a little interaction in our cards! I kept the colouring super simple on all of the elements, all of which are stamped with Memento Tuxedo Black ink on 110lb Copic-friendly cardstock. So while we're chatting about mistakes (in the video) I also didn't really put the card together the way I wanted. The pull up panel goes waaaay further than I wanted because I didn't use the stopper mechanism - and they provide it for a reason. Sooo maybe next time. Whoops! 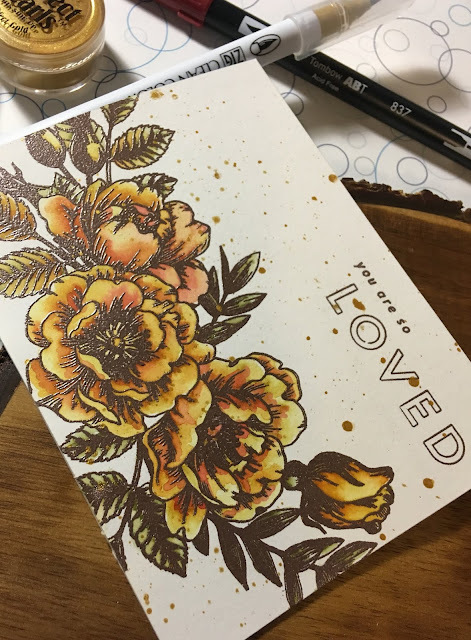 Adding Dimension with Coloured Pencils | ft. Simon Says Stamp "Beautiful Flowers"
Today I want to share a card I created using Simon Says Stamp's "Beautiful Flowers" stamp set, Distress Oxide inks and PrismaColor Premier pencils. The end result of this card is not what I had planned. I had just wanted to do an ombre background and stamp the image over top, just something super simple so I could get back into the swing of things. I've been having some serious issues getting over my creative block. I have a lot of ideas and I find that they build up but then I can't get any one of them out on paper. It's incredibly frustrating. I began with applying Squeezed Lemonade, Ripe Persimmon and Abandoned Coral Distress Oxide ink to my panel. I then splattered it with clean water and then splattered again with Perfect Pearls in gold. Once that was dry, I put the panel in my MISTI and stamped the large floral image from Simon Says Stamp's "Beautiful Flowers" with Simon Says Stamp Intense Black Ink. I had planned on leaving it at that (after adding the greeting from Beautiful Friend), but then I thought I would add a little bit of colour in the areas where I wanted shadows. Then down the rabbit hole I went. I just couldn't stop myself. I started adding darker and darker shades to deepen the shadows. Once the shadows were there, it occurred to me that the highlights weren't highlight-y enough. When all was said and done, it was completely different than I had originally planned. I intentionally did not do anything with the leaves, I wanted just the flowers to really pop off the page. Kind of like a one layer spotlight technique. Today I wanted to share a card (and video - two days in a row, peoples!!) featuring the Beautiful Flowers stamps set from Simon Says Stamp. I received this in one of their monthly kits, but I think it is still available independently on their site. I wasn't sure how much I was going to love the giant floral images, turns out I love them a lot and I cannot wait to get more. There is a Sketchy Flowers coming in the October card kit, but that hasn't made its way to me yet.... I've been checking every single day and it's like that commercial where the little kid looks so hopefully only to be woefully disappointed - that's me. Every. Day. I can only imagine what my neighbours think when I shuffle back to the house empty-handed. So I've done some cards using the Zig Clean Color Real Brush Markers and I've done some cards using the Tombow Dual Brush Pens but I've never used the two together. Until now. I didn't have quite the palette I wanted to use in either set, so I ventured just a bit out of my comfort zone and used both sets. I stamped the image using VersaMark embossing ink and heat embossed it with Ranger's Rose Gold embossing powder. It's pretty, but it really wasn't as "rose-goldy" as I would have liked. I have a new powder that has arrived (between the filming and the voice-over for this video) and I'm looking forward to trying that out. Today I want to share a card (and video) featuring Lawn Fawn Stamps and Dies, while I have done company mash ups in the past, where I mix different companies together, today I decided I was going to do a seasonal mash up. Where I live it can be any season at any time, and we are currently experiencing a Fall/Winter mix. Gotta love the prairies. Check out the video above to see how this card came together. You'll also see the list of Copic Markers I used and some initial thoughts on the Lawn Fawn embossing ink pen. 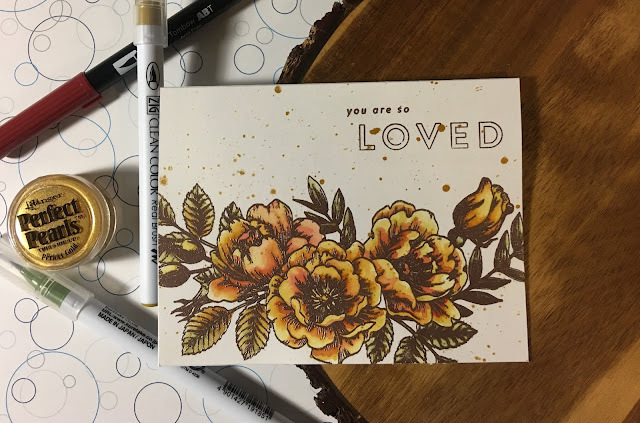 So this card also has some new to me products, including the Lawn Fawn embossing ink pen, the Lawn Fawn Textured embossing powder and the Marvy Snow Marker - So I have used this marker in the past but I think this is the first time I've used it in a video or in a card that I've posted to the blog. If you have never used the snow marker before, but want to add some super fun texture to a card you should check it out. In the video I try to do a close up of the poofing that happens when you apply the heat gun to the marker stuff. It's like MAGIC!! Sweet Birthday | ft. Lawn Fawn's "Sweet Friends"
Today I want to share a simply sweet birthday card featuring - you guessed it! - Lawn Fawn's "Sweet Friends" stamp set and Copic colouring. I wanted to create a clean but fun birthday card, and while digging through my stash, looking for inspiration, it occurred to me that I haven't used this set very often. So here we are. To begin, I cut down a piece of 110lb Copic-friendly cardstock and stamped the doughnut image with Memento Tuxedo black ink randomly about the panel, taking care not to stamp in the middle where I wanted my greeting to go. 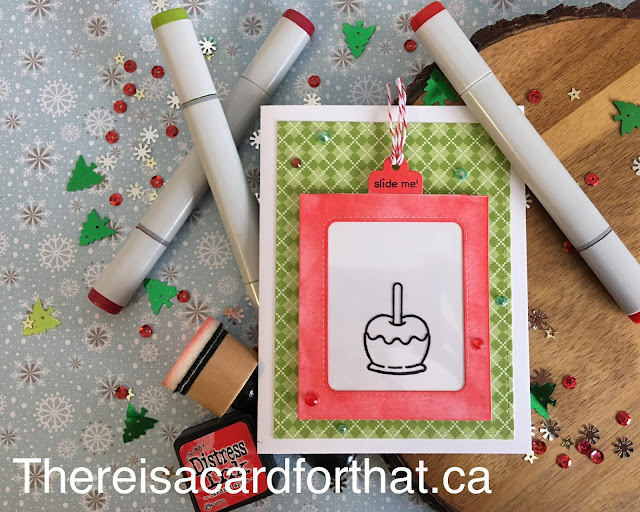 I stamped the first and last part of the greeting with Lawn Fawn's Black Licorice ink then stamped the "sweet" in three different shades of Lawn Fawn ink. I coloured the images in with Copic markers. I wanted to create an assortment of doughnuts but not get too out of hand, after all, I wanted this to be a simple card. Next I used some warm grey markers to create a drop shadow at the bottom leftish of each one and in the top right of the hole, so it would appear as though my light source were coming from the top right of the panel. I trimmed a piece of the Really Rainbow paper to just smaller than my standard A2 sized card base and adhered that down using my tape runner. I popped my panel up on foam tape. To finish off the card I added a couple layers of Clear Wink of Stella glitter pen to the icing parts then covered each of them with glossy accents. Today I have a masculine card (and video) featuring -- SURPRISE!!! Lawn Fawn Stamps and Dies. I needed to create a birthday card for my grandfather who turned 86 this year! 86!! And still strong as an ox. He's totally one of my favourite people in the whole world and he got a real kick out of this card. We had his birthday dinner on Saturday (Chinese food - because that's what he loves) and he thought it was great. He even texted me during dinner to say thank you. When you watch the video, you'll see that my process isn't really as smooth as it generally is. Or at least as smooth as think I am because I had a little person talking at me and asking me questions and trying to get me to do stuff for her. I used Distress Oxide inks to create a simple background so that my little scene wasn't just floating in the middle of nowhere, I used Cracked Pistachio and Tumbled Glass; there is absolutely nothing special about this. I just wanted to get colour on my panel. 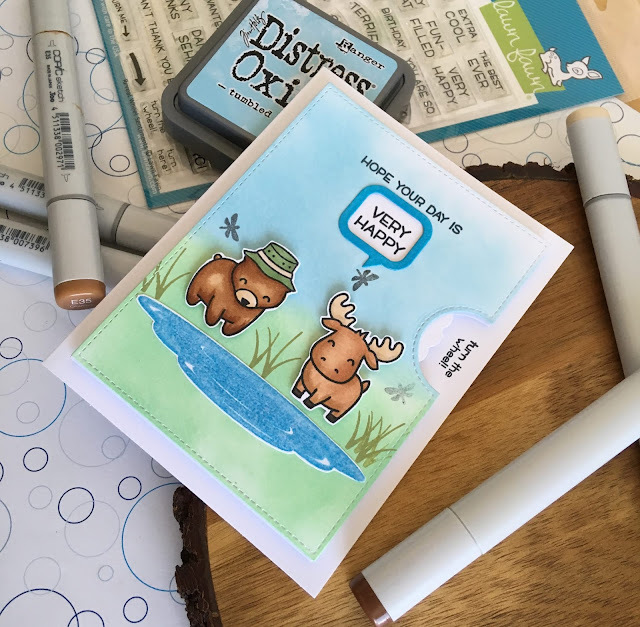 I used Lawn Fawn Dye Inks to stamp my little water patch from the Dad & Me set, I knew that it wasn't going to be a solid stamped image and tried to use that to my advantage by restamping the image a second and third time with a lighter colour ink to make it look more like actual water. I wanted to finish off the inside of the card, something I don't typically do. For this one I stamped the images in second generation Distress Oxide ink and then stamped the sentiment from the Reveal Wheel Sentiments with Memento Tuxedo Black ink. For the grass and dragonflies around the little scene I used Peeled Paint and Black Soot Distress Oxide ink. This isn't in the video because of a certain little person who just *needed* to have my attention. But I do talk about that in the video. 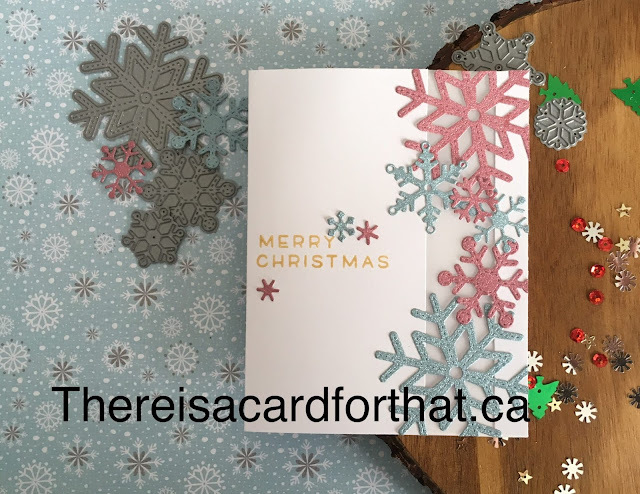 Today I wanted to share a card (and video!!) featuring MFT's "Harvest Mouse" stamp set, which I think came out last year or maybe even the year before that, but I was completely unable to get my hands on it at the time. Then the other day I was going through Pinterest and I saw this set come up and I was all like "heeeey!!! I have that set!" and now we're here. I hope you like today's card (and video) and are inspired to create something of your own. If you haven't already, please follow me on the right side bar, over on Facebook and on YouTube. Drop me a line in the comments section below and let me know what you think! Today I want to share a card (and video) as the first in this year's Happy Holidays series, featuring Lawn Fawn's "Thanks a Latte"and "For You, Deer" stamp sets, as well as several of their die sets! I recommend watching HD over on YouTube! It feels a bit early to start posting Holiday cards, but as I mention in the video, I got some new Lawn Fawn goodies so it just had to happen. I do still plan to be posting some Fall and Halloween themed cards, but it's cold and yucky out today so it just felt like a winter card. As many of you know, I'm in Alberta, Canada where winter starts early and sticks around forever. Let me tell y'all, my winter tires stay on the car longer than my not winter tires and that is just a sad, sad thing. So not only am I able to use THREE different pieces of patterned paper, I actually did paper piecing for the scarf on the mug. I know!! Totally not something I would normally do, but there it is! To be honest, I saw it on the YouTubes and it was just too cute not to try. 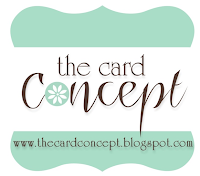 If you click on over and check out the video, not only will you get to see how this card came together, you'll also get to hear my thoughts on the Tim Holtz/Tonic Glass Mat. I know he talks about it being a "game changer" in his intro video, but having tried it for myself, I can certainly recommend it. Blending is a whole lot better. I don't know if you noticed, but there isn't a whole lot of embellishments on this card. Maybe the more patterned paper I use, the fewer sparkles I feel the need to add. Not sure how I feel about that. It's been a crazy couple of weeks. The cold I mentioned in the last post lingered for-ev-er!! I actually had to take sick time off work, and that is not something I like to do. Today, however, I took a couple days off - just because. It's quiet at work, so the timing was optimal. 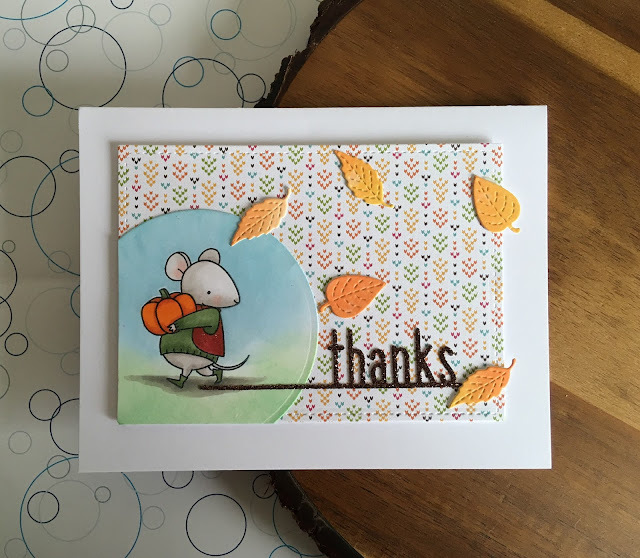 Anyway, today I thought I would share a fun fall card using the Reveal Wheel die set, the Pick of the Patch pumpkin add-on die and the Pick of the Patch stamp set. I stamped all my images with Memento Tuxedo Black ink on 110lb Copic-friendly cardstock and coloured them with Copic markers. I wanted to do something a little different, so instead of setting the add-on die in the reveal wheel set using the little puzzle piece notch, I eyed out the distance and turned the die upside down. This allowed me to have the pumpkin right side up, but at the bottom of the card so it could still be in the patch. To create my background, I used some Distress Inks to create my night sky. I mixed up some Perfect Pearls in the perfect pearl colour with water and splattered that on the panel to get some shimmery stars. I also splattered some clean water on the panel for some variance. I used one of the grassy borders to cut some of the Knit Picky paper down to make my base. 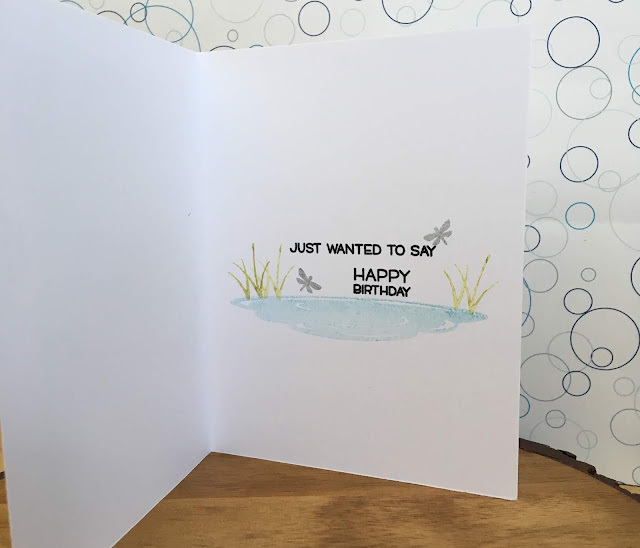 Once the panel was completely dry, I stamped my greeting with VersaMark ink and heat embossed with detail white embossing powder. I assembled my Reveal Wheel mechanism and added my critters and grass. I adhered another piece of the Knit Picky paper to my standard A2 sized card base, then adhered my Reveal Wheel piece on top. Sooo, the kids are all back at school now. Three kids, three different schools, an average of about 600 kids per school means there are 1800 kids worth of germs in my house right now, and I got them all. I don't get sick very often, but when I do... holy crap it hits me like a truck. I'll spare you the "juicy" details of what I can only describe as the great head cold of 2018, but that's the reason I haven't managed to do a voice over. I have a couple videos all edited and waiting for the voice over, but I'm sure you will appreciate not having to hear me breathe as though I had just run a marathon, and sniffle every two seconds. Trust me, I'm doing you all a favour. For today's card I thought I would share my first attempt using the "Double Slider Surprise" die set. We all knew this was coming, I mean, when have I EVER been able to resist a Lawn Fawn item? I thought for my first attempt I would keep it relatively basic, using the "You are Sublime" and "Duh-Nuh" stamp sets. Now, if you haven't watched Lawn Fawn's "Intro to Double Slider Surprise" video, I highly recommend that you do so before attempting this card. A couple of times. I'm a HUGE fan of their interactive dies, and while this one is no different, it's going to take a bit of practice, at least for me. Lemme tell ya. The dies themselves are straightforward, the only one that I had issues with was the tab cutter, which makes the little indent on the sleeve. I wasn't sure what to line it up with, and as you can see in the photo above I did not line it up properly. All the images are stamped with Memento Tuxedo Black ink on 110lb Copic-friendly cardstock and coloured with Copic markers. I used the Brother 2 Scan N Cut to cut them all out. To create all my background I used Distress Inks with my blending tool in various shades of blue for the water and Scattered Straw with Gathered Twigs for the sand. Another mistake I made, was deciding at the end to add the little pull tabs, I totally should have added them before my layers - but that's on me. And let's be honest, any difficulties I had with this set are totally on me. And that's okay with me. I love a challenge and having a set that is more for the art of it, than for mass production is A-OKAY. So if you've received a card like this from a loved one, think twice before tossing it. More than a little bit of work went into creating it. To adhere all the pieces down, I ran them through my Xyron mini X sticker maker, I've found that I can move them around a bit as a long as I haven't pushed them down completely. I cut a piece of the Really Rainbow patterned paper to the front of my card - and then die cut my pull tabs from the piece I trimmed. This is when I discovered I should have done that waaay before this point. To make the slider stick to the front, I covered the back with Scor Tape - which is a super sticky two way tape that I would recommend in all sizes for all things. I never have to worry about this stuff coming off. To finish off the inside of the card, I used third generation stamping of the little submarine from the "You are Sublime" set, and first generation for the sentiment. I added a couple of the extra pieces I had coloured just for some added interest and so they got to fulfill their paper destinies. I hope you like today's card and are inspired to create something of your own. If you haven't already, please follow me on the right side bar, over on Facebook, and on YouTube. Drop me a line in the comments section below and let me know what you think. 2018 Sporadic Fall Series | ft. Lawn Fawn Mini Pop Up Box Die Set and You're the Pick of the "Patch Stamp"
So given my terribly inconsistent posting (for which I cannot apologize enough) I can, at best, promise only the most sporadic of postings for this series. Which is shocking, considering that this is by far my most favourite season. Sadly, by the time I get home from work, we have dinner and get the kids all settled, I'm just not in the head space to be in the craft room. There have been a couple days where I have plowed through and been in there, but then sent out the cards without taking pictures. To which I end up being super unhappy with myself, because you'd think that after blogging for this long, I would know my own routine. Anyway, it hasn't stopped me from BUYING all the new things, especially when it comes to Lawn Fawn. Today's card features the Mini Pop Up Box die set as well as the brand new "Pick of the Patch" stamp set. Both of which are SUPER fun to play with!! To begin, I stamped the squirrel as well as the pumpkin with Memento Tuxedo Black ink on 110lb Copic-friendly cardstock, coloured them with Copics and fussy cut them out. Normally I'd use the Scan N Cut, but I'm doing some reorganizing in the art room right now, and it's a little inaccessible. I used one of the frames from Lawn Fawn's "Mini Picture Frames" die set to frame up my images then added a length of natural twine and a brad to make it look like it was hanging. All of the pattered paper in today's card comes from the Knit Picky mini 6x6 paper pack. I cut the mini box from some 65lb Kraft cardstock and added the side panels from the extra patterned paper on the front. 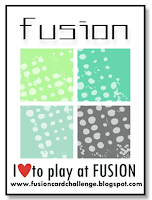 I stamped the rest of my images, coloured them and fussy cut them out. To make them all stick I used the Nuvo Precision Glue Pen (which I LOVE). 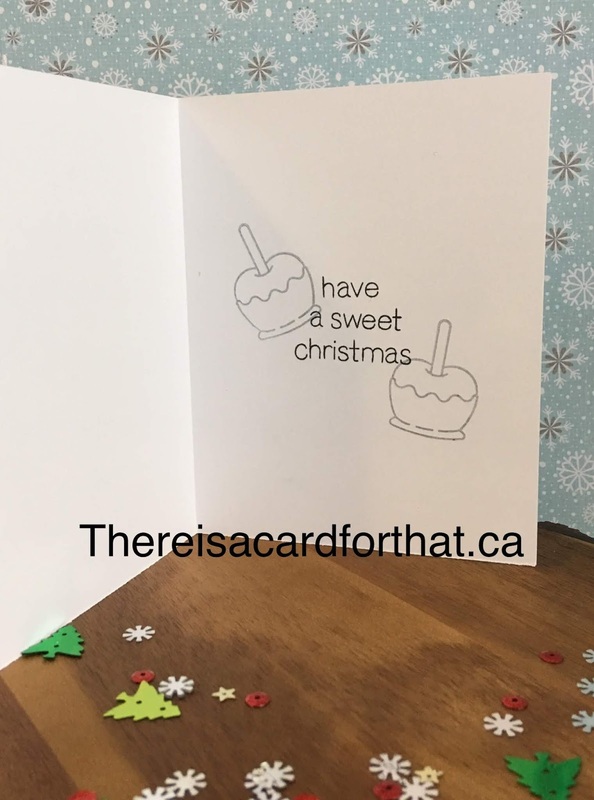 When I create another of these cards, I will rotate the box so that the triangles (where it attaches to the inside of the card) open at the top. It wasn't until afterwards that it occurred to me, they shouldn't be visible from the angle at which you are looking at it. But, live and learn, right? Much like the Shadow Box die set, I love how you can get so much more dimension in such a tiny space. Of the two new interactive die sets, this one is currently my favourite. It doesn't take a whole lot of effort to make a BIG surprise on the inside of an already super fun card. I hope you like today's card and are inspired to create something of your own. If you haven't already, please follow me on the right side bar, over on Facebook and on YouTube! Drop me a line in the comments section below and let me know what you think! CAS Father's Day Card | ft. The Sassy Club "Sassy Wars"
So this is really late, or maybe really early depending on how you look at it. Either way I don't know how I missed posting this way back in June and it was too sweet to not get put up. Last weekend I had the entire house to myself. The girls were with my mom and the hubby took our son out of town for a soccer tournament, so I made tons of cards. More than I had made in a really long time. And that's SUPER news.... expect I forgot to take pictures of them. I didn't take a single picture for the blog before getting them out to the shop. So this week, as I was searching for something to write about today, I came across this one. And like I said I have no idea how I could possibly have missed it. To begin, I stamped the image and greeting from "Sassy Wars" with Memento Tuxedo Black ink on 110lb Copic-friendly cardstock. I then coloured the image with cool grey Copic markers. I used warm grays for the shadows. I adhered the panel to a piece of red cardstock cut slightly larger, then mounted the entire thing to the front of a standard A2 sized card base. To finish it off, I covered his entire suit with Clear Wink of Stella, because why WOULDN'T he sparkle? And that's about it. I'm kinda sad I didn't get this up in time for actual Father's Day, and I'm even more sad that I didn't really even notice that I had missed posting it. But the good news is, it's up now and I have one stored away for next year! Hello, everyone. Thank you for stopping by. I hope you're having a great day. Today I have a new card for the Monochrome Monday series, even though it's a little early. I was late on the last one, so I think this makes up for it! The Greeting Farm stamps are relatively new to me. I don't have many of them but the ones I do have I'm very happy with. I'm in this encouragement card phase right now, and I'm not sure why. Generally my cards reflect my frame of mind, so maybe I need some encouragement in my life, or maybe one of you out there need some encouragement, either way - I gotta do what's going on in my head. Here's a little lesson about glitter pens! Make the Card Fit Your Scene - Deepest Thanks | ft. Lawn Fawn "You are Sublime" and "Jawsome"
Today I'm going to share a fun way to get all the images you want on to a single card. Just make the card bigger!! Sometimes the hardest thing (especially with Lawn Fawn) is getting all the images we want to use on a standard A2 sized card base. These images are so stinkin' cute and their sets coordinate so well that we just don't always have the space we want to make the scene in our heads come to life. So why not make a bigger card? Who says all our cards have to be the standard A2 size? Today's card is a whopping 9x4" and even then I had to remove a couple from my vision. But hey, it happens. Don't limit yourself, do what makes you happy. To begin, I cut a piece of 110lb Copic-friendly cardstock to just slightly smaller than my 9x4" card base. I stamped all of my images using Memento Tuxedo Black ink, then masked them off. Once the masks were all in place, I used Tumbled Glass, Salty Ocean and Blue Print Sketch Distress Inks to create my background, working from top to bottom to get a smooth blend and adding more ink as I went so it would be darker at the bottom. Once that was completely dry, I removed the masks and coloured all the images using Copic Markers. If I were to go back and do this card again, I think I would have used some of the solid image stamps to create more in the background to give the card some extra depth. I mounted my panel the front of my card base using my tape runner. Then to finish off the card I used some "Ocean Wave" crystals from Studio Katia to be the bubbles and applied Glossy Accents by Ranger over the windows of the submarine and the visor of the diver. Today I have card and video showing you how to get more out of your dies. For this card I'm using the Lawn Fawn "Shadow Box Theatre Add-On" die. This is made to go with the Shadow Box card die, but I'm going to be using it to set my stage (hehehe) for this encouragement/congratulations card. I love sets that can be used in more than one way, it makes me feel like I'm really getting all that I can out of my die. I recommend watching in HD over on YouTube!! While I'm not typically one for paper piecing, I just couldn't even resist this set. How many awesome scenes can you make with this set? 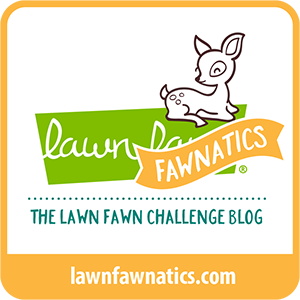 Lawn Fawn is AH-MAZ-ING for making sets that all work together! Check out the video to see how this card came together and my thoughts on a new liquid adhesive! 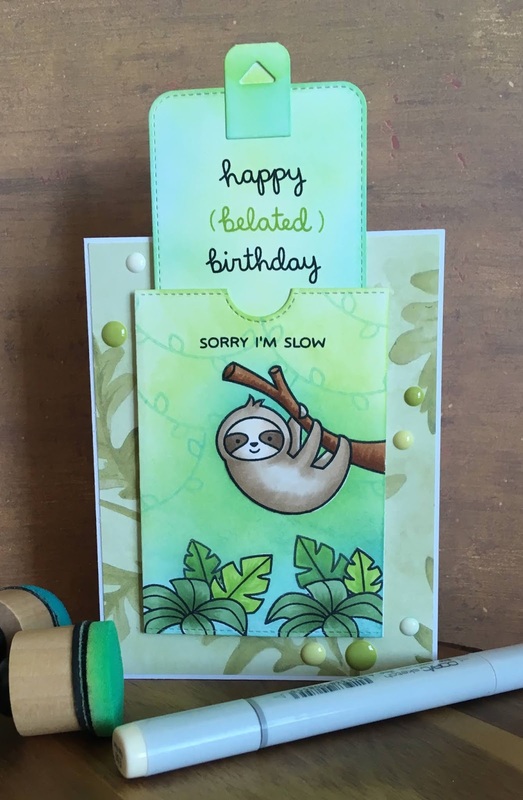 Hello Little Monkey | ft. Hello Bluebird "Jungle Littles" and "Spring Script"
Today I'm going to share a card that I created for my friend who just had a new baby! He's about the cutest darned thing I've ever seen, let me tell ya. When I saw these little critters from Hello Bluebird stamps, I about died. Mostly for the sloth because that's my favourite animal, but the rest of them are just as sweet. They went with a monkey jungle theme for the nursery so this one worked out perfectly. To begin, I stamped the monkey and the vine with Memento Tuxedo Black ink on 110lb Copic-friendly cardstock. There was a bit of masking involved, as I wanted him to be swinging by his tail, to fill in any lines that were missing, I used a fine-tip Copic-safe black pen to draw them in. I then coloured the images with Copic markers. For the greeting, I prepped the lower part of my panel with my powder tool, then stamped the large "Hello" from the "Spring Script" set with Peeled Paint Distress Oxide Ink (using the MISTI, just in case) then heat embossed with clear embossing powder. Not only does this help the Oxide ink dry faster, but it gives just a bit of dimension and some shine. I stamped the "There" with VersaMark ink on black cardstock and heat embossed with white powder and trimmed it down. I mounted my panel to a piece of patterned paper then adhered the whole lot to the front of a top folding standard A2 sized card base. To finish off the card, I used some clear Wink of Stella on the leaves and the banana and then coated them with Glossy Accents by Ranger, because while he may not appreciate the shine, I know his Mom did. Hi everyone, thank you for stopping by. I hope you're having a great day! 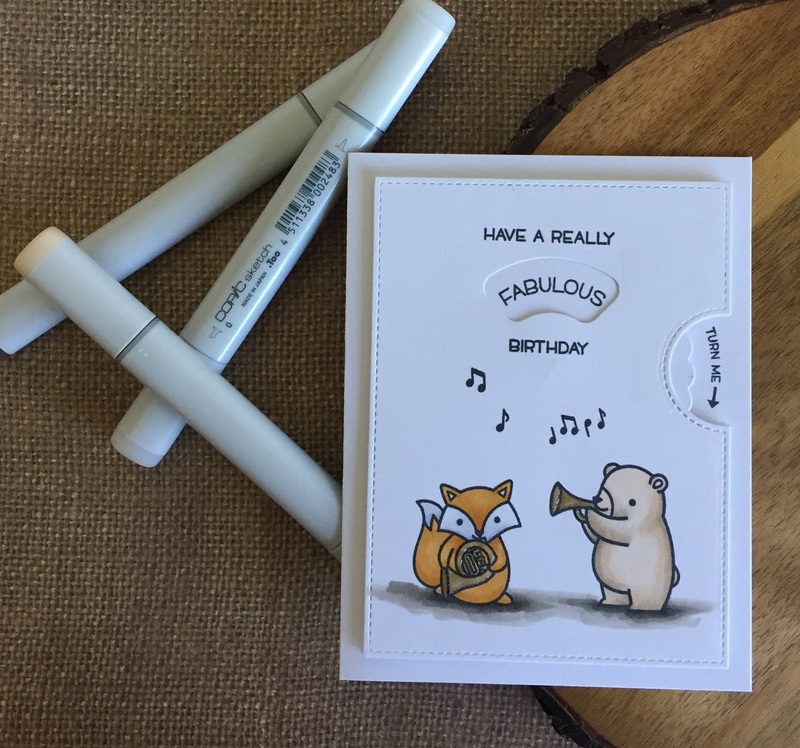 Today I'm back to share with you a CAS Birthday card using the new interactive Reveal Wheel die set from Lawn Fawn along with their new Critters in Concert stamp set. 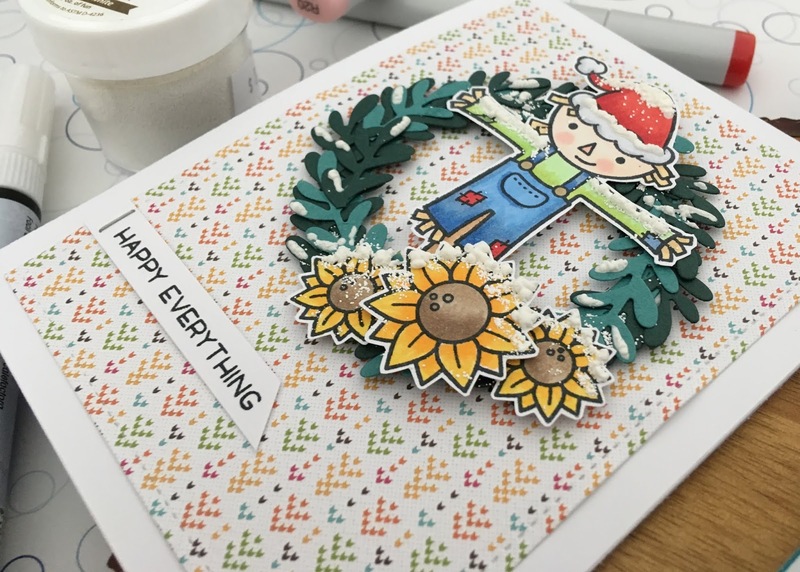 Watch the video to see how this card came together! This die set makes creating a reveal card so incredibly easy. There really isn't a whole lot more work to take your card to the next level. To see this card come together and see the list of Copic markers I used, check out the video! As well as my thoughts on animals playing instruments, LOL. Today I wanted to share a card with you that is a little out of my comfort box. If you've been reading or following on YouTube for any amount of time, you know that I love me some stamps to colour. I love making little scenes and doing all the cute little things that brought me to this community. Today's card is a little different. Today, I'm working with a layering set by Altenew. I love their stamps, especially the floral ones, what I don't love is the price here in Canada. The exchange is just craziness! But I couldn't stop myself with this one! To begin, I cut down a piece of Strathmore 140lb cold press watercolour paper and put it in my MISTI. I selected two shades for each flower, a lighter for the solid and a darker for the more detailed layer. I positioned the solid stamp where I wanted it and closed the door to the MISTI, I then coloured directly on the stamp with the Tombow Dual Brush marker, gave it a little spritz with my Distress Sprayer and closed the lid. At first I wasn't thrilled. But I've said, time and again, that if you keep going, you'll probably like it when it's done. I repeated this process for each of the flowers. I gave the panel a bit of time to dry, not completely, just so it wasn't really wet anymore, then positioned the more detailed stamp over top of the original solid image. I coloured directly on with the darker shade, spritzed again and closed the lid. I then repeated the process for the other two flowers. Once the panel was dry, I scribbled each of the darker shades on to my acrylic block, added a bit of water and used a paintbrush to splatter the colour over the panel. I allowed the panel to dry again, then prepped it with my powder tool and stamped the greeting from Simon Says Stamp "Beautiful Day" stamp set with VersaMark ink, and heat embossed with detail black embossing powder. I then mounted the panel to the front of a top folding standard A2 sized card base. The colours I used are: Blue - 452 and 443, Purple - 603 and 636, Pink - 743 and 755.